Well, it’s the 1st of April and the Everest machine is fully operational. Climbers from around the world are streaming into Kathmandu and others to Lhasa to begin their journey to the base camps on opposite sides of Mount Everest. For those just arriving, the excitement is palpable. For those left back home, the reality is just setting in. And for those who climbed last year, but are home today, their emotions are mixed. When the airplane door opens, you feel Nepal. You can taste the humidity, the thick air of Kathmandu. Deep down you know that your first step onto the tarmac will not be the last time you make this journey. Retrieving your bags reminds you that you have gone back in time by 50 years, perhaps to a small airport in rural Australia or Oban, Scotland. With bags on the wobbly trolley, you make your way past security noting the X-ray machine was unplugged. Your trust in the system is about to get the first test as you leave the airport and scan the line of drivers holding up signs. Then you see it, your name. Your tense and tried shoulders drop half an inch. This scene will be repeated about 500 times just for Everest climbers this season, tens times that if you include trekkers. The Everest season is not just about climbing, it’s also about the lifeblood of a country. Between the trekking and climbing industry, it’s estimated to bring in tens of millions of dollars to one of the world’s poorest economies. The average income in Nepal hovers around USD$600. Giving the guy who helped move your duffle one meter a $5 dollar tip reinforces why Nepal loves tourists. Meeting your team for the first time is always an exercise in human psychology. While you are certain that your experience and skills are more than sufficient to scale Everest, looking at some of your teammates causes you to question theirs! The time-honored process of forming cliques begins at dinner. You sort out who you want to walk beside and those you want to be separated from by a camp or two. Your guides make their first impression – type A personality or another “climber dude”. Regardless they will watch your every move for the next two months. Climbing has been a male-dominated sport but that is changing and for the better. As more women seek to join the summit team, the nature of the sport has evolved. No longer is it acceptable not to bathe or brush your teeth for weeks on end. The toilet humor jokes now take three minutes to begin instead of the usual three seconds over breakfast. The solitary individual who makes every rotation a competitive race no longer receives the “attaboy” from teammates. Women climbers are smarter, faster and safer than most of their male counterparts. You would be wise to partner up now. After two days in the Khumbu or crossing the border at Zhangmu, you question the wisdom of spending $500 on your new fancy, highly-accurate altitude watch. Time moves like a sleeping dog in this part of the world. The strict training schedule and diet that held you hostage for the past year has now morphed into a life of eating as much as you can and sleeping as long as you can. Yes, you are now living the dream! On Kilimanjaro you learned Swahili for slow was “pole, pole” now you are learning it in Nepal, “Bistārai” or as Kami said to me often “No hurry, chicken curry” (never did figure that one out)! But language aside, there is a new pace to your world. You walk slow, eat slow, talk even slower. You actually pause on the trails to take in the view or at least get that great selfie to post on Facebook at the next teahouse. Yes, life’s great frustrations have shifted from slow drivers on the M4 to waiting for a yak train to pass by. The base camps on both sides are scenes of challenging work. 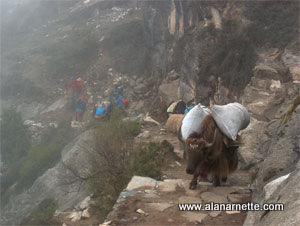 Before tents can be erected, platforms must be carved out of rock and ice on the Nepal side. The large tents used for cooking, storage and dining must be tied down to withstand high winds, especially on the north where it never relents making people yearn for a silent night’s sleep. Heavy trucks disturb the tranquility on the north while helicopters occupy the south. The days of a thousand porters marching in silent are gone forever. A few teams for the 2018 edition of Everest have already arrived but most are still driving or trekking. All are hoping EverestLInk will be up on the Nepal side and ChinaTelecom functional on the Tibet side. Access to WiFi has become standard for all teams on Everest. I began this article with a mention of how people may be feeling. I have often written about the “ones left behind.” The spouse, friends, family that gave you all that encouragement for so many years. They hoped that this day would come for you. Now that it has, they are coming to grips with what life will be like until June 1. The climber knows what they are doing each moment while those at home can only wonder what is happening on the other side of the world. For the climber, it’s show time. All the dreaming is now behind you. It’s time to stop training, wondering about gear, which guide to use and all the other thousand questions that have occupied your subconscious, and often your present state of mind, for way too long. If you are not excited today then your blood may already be cold. This is what you have been working hard to achieve, but it has also just begun. This is a marathon, not a sprint so relax and let every moment seep into your essence. And if you were on Everest last year, or a few years ago, this is a tough time for you as well. Your memory is strong and alive with images and sounds of landing at Lukla, seeing that first big yak, hearing the monks softly chanting. One memory may shroud all the rest, that first view of the Big E from the Everest View Hotel. You sipped the freshly brewed instant coffee on the wood deck and let your eye trace the skyline of Everest, Ama Dabalm resting in the foreground. For a split instance, you saw yourself on the Southeast Ridge, struggling to take one step higher, gasping for breath only to lift your head to see teammates slightly above in the soft glow of headlamps. But this year, you are home. Every year, April and May is a time of dreams and memories. It’s a time of review and plans, a time to let yourself go to a different place and time – even if it is only in your quiet moments of reflection. Remember that most teams will not enter the Icefall until mid-April. Hopefully a few will start early this year. I am updating my annual team tracking page that shows the current location of the majority of their team. I also use that page to post brief updates almost daily. Not to be forgotten are those on the other 8000ers of Lhotse, Dhaulagiri, Kanchenjunga, Makalu, and perhaps Annapurna, Cho Oyu, Shishapangma and Manaslu. I’ll report on those as available. But for now, here’s to Bob Seiger and of course, Kathmandu! A good of an explanation as any!!! Thanks Phil. Enjoy your posts Alan, but didn’t like the put down against men, saying women are smarter, faster and safer than most male counterparts.